300 sharks and counting ! This year’s season was rather unusual. Sharks arrived spot on the 1st of October and stayed all month, then for two weeks we experienced bad weather due to a nearby cyclone and it seems whale sharks were just gone. When we finally saw Michel again, around the 10th of October, all of his remoras had gone (the small fish that encroach on the shark’s skin). We suspect he, like other whale sharks at that time, visited deeper waters and thus left his remora friends in the upper layer, as it seems remoras can only reach a depth of 85 meters. As you can expect we were thrilled to see the sharks back, and they did come back ‘en masse’. We even witnessed 14 sharks on the 26th November, a record ! Through this year’s season we collected data on 97 days, adding up to nearly 400 encounters with whale sharks ! All data is being processed and we will be able to come up with a final number for the season in a few months after having analysed all the encounters. I can already say we saw more than 120 individuals this year, a record number for the project , in addition to crossing the 300 line since the inception of the project in 2015! We also had the privilege of experiencing a few ‘manta’ days in October and December where giant manta rays came to feed on large krill patches. 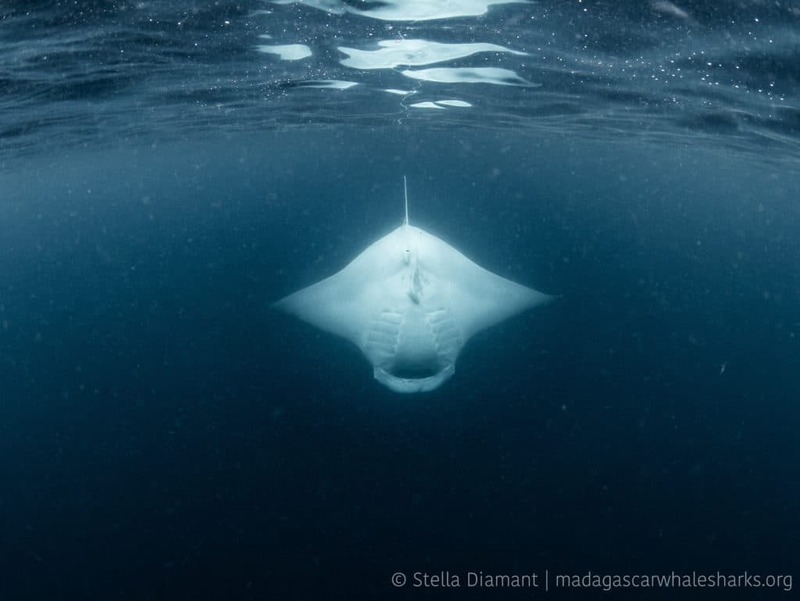 Interestingly, the manta rays we observe in Madagascar are referred to as leucistic, a type of morph where manta rays in certain areas, although from the same species, bear whiter coloring. Such beauty … Like whale sharks, manta rays have unique spot patterns (on their bellies) that we photograph and upload online onto Manta Matcher to then recognise individuals and check whether they have been spotted elsewhere. This year we had more manta days than previous years, excited to see whether we see the same individuals year after year ! In October, together with project co-supervisor Dr. Simon Pierce and journalist Martin Fletcher we cruised to the stunning Mitsio Archipelago in search of whale sharks. We spotted lots of bait balls, Omura’s whales and humpback whales, but no whale sharks. It was very useful for us to finally discover this remote corner of our study area, but the catamaran was not ideal for research. Sadly due to lack of funding I couldn’t go back to Analalava, the second hotspot off North-West Madagascar. We are however planning a one-of-a-kind exploratory expedition with Natural World Safaris for next season, using an appropriate research vessel to reach this remote area and study whale sharks. Limited places so contact us directly if you’d be interested ! We also welcomed Dr. Andrew Brierley and Dr. Martin Cox in December, who came to do an acoustic survey on small prey species that whale sharks seem to feed on. Excited to see the results ! We have started our socio-economic survey amongst both tourists and operators, and are pleased to have gathered quite a few, which will be crucial to further implement the code of conduct next year. Thanks to all the patient tourists for sitting through our interviews ! A big part of our data was collected by our amazing team of volunteers, thank you Juliette, Mario, Guillaume, Chloé, Pierre, Diane, Chantal, Fanny, Amandine, Raphaël, Tine, Léa, Floriant, Alexandra and Stéphane! Léonce (pictured above) our field assistant, returned to university in Tuléar to write up his master thesis about whale shark spatial distribution in Nosy Be. He has been making great progress and we hope he can join us again next year. Bruno is off for the Christmas holidays, but will be continuing to deliver our education program over the next few weeks, finalising this first run of the program, and hopefully will stay with us in the future (see below !). Thanks to our local operator Les Baleines Rand’eau for taking us out at sea, to our partners the Marine Megafauna Foundation and MADA Megafauna, travel companies Aqua-Firma and Natural World Safaris, to our funders VOCATIO, Clear Reef Social Fund, Idea Wild, Cressi and to project friend I Am Water Ocean Travel. Your support has been instrumental in making this season come to life. Special thanks go to Léa Gonçalves (Crowdfunding), Sophie Gaudin (Educational support), Melissa Hobson (PR) and Claire Eloy (Data entry) for their outstanding help, and to Marie-Noëlla Wai Lan Chan, Claudia Andrianaivo and Franklin Klaasse for adopting some of our whale sharks ! And to you too ! Last but not least, I wanted to thank everyone who participated to our ambitious crowdfunding campaign this last month, together we raised more than 8000 Euros! This means we can continue our education programme, scale it up and target more schools and kids by keeping Bruno year-round to widen our impact, an incredible achievement for our small team. That’s all for now, stay posted for the results of this year’s season, coming soon ! Today’s the day! After many years in Madagascar and a lot of hard work this year, I am happy to unveil “The Guardians of the Ocean”, our crowdfunding campaign aiming to fund the Madagascar Whale Shark Project’s education program over the following years in order to raise awareness about marine megafauna. Thanks to seed funding this year I could recruit and train Bruno, and initiate the program amongst two schools. To ensure the program’s success, our efforts have to last, hence why we decided to launch a crowdfunding campaign to keep Bruno year round and initiate other projects. Please check out our project and share it with your network. We have 29 days to collect 5000 Euros to continue the project for a year, 12 000 Euros for two, 22 000 Euros for three… And why not more! A big thank you in advance for your help. Sorry it’s been a while, we have been incredibly busy! While the whale sharks were initially late, they have arrived ‘en masse’ to Nosy Be this year since the start of October, with more than 14 different whale sharks identified in a single day last week (our record!). Since the year started, our team has identified a whooping 43 different individuals, with 23 ‘new’ sharks that we had never identified before. This brings us to a total of 261 sharks since the inception of the project in 2015! We still see the friendly regulars, such as Michel, Georges, Théodore, Ignace, Alphonse and Clasperfin, sharks that we see each season since 2015. It is a relief to see them alive and healthy, although Théodore seems to have injured his dorsal fin since last year. We haven’t seen Sirius yet. We are happily settled in MADA Megafauna‘s new office next door to Les Baleines Rand’eau‘s new shiny center in Madirokely. It makes a big difference to have a few desks and laptops to process data, and we have possibly the best office view. We have grown! As part of a new collaboration with the IHSM we are happy to welcome Léonce, a student in marine biology at IHSM, as our first Malagasy scientific assistant. Thanks to the ClearReef Social Fund, we have also recruited a local animator, Bruno, who will be soon delivering the education program to two local schools in Nosy Be, as well as animating activities focusing on the ocean with the kids every Saturday since a month. A great success so far! As part of our ongoing collaboration with MADA Megafauna, like last year we are hosting ‘scientific stays’ allowing tourists to join us for three weeks and help us collect data. Thanks to Juliette, Guillaume, Mario, Chloé, Pierre, Dianne and Chantal for all their help and enthusiasm! Ahead of the season, I delivered a few refresher training sessions on the code of conduct, which were very successful. I met up with new operators who were keen to adopt our guidelines for safer and better interactions with whale sharks, and we definitely see the results out on the water. Thanks to all the operators who adopted the code of conduct so far! Finally, we are excited to be returning to potential new whale shark hotspots in the region, with two research expeditions planned later this season, and looking forward to the visit of project co-supervisor, Dr. Simon Pierce. Stay posted for more updates! Truckee (California), May 17, 2018. A new study published in the journal Endangered Species Research has revealed that juvenile whale sharks swim to Madagascar, a newly-identified hotspot for these huge fish, to feed. Eighty-five individual sharks were identified in a single season using photographs of their distinctive spot patterns. An isolated ‘island continent’, famed for animals and plants that exist nowhere else in the world, Madagascar’s nutrient-rich waters are also home to an incredible array of marine life attracting increasing numbers of tourists. Whale sharks are primarily seen around the small island of Nosy Be, in northwest Madagascar. This area is a globally important hotspot for large marine species, including manta rays, sea turtles, humpback whales and even rare Omura’s whales. 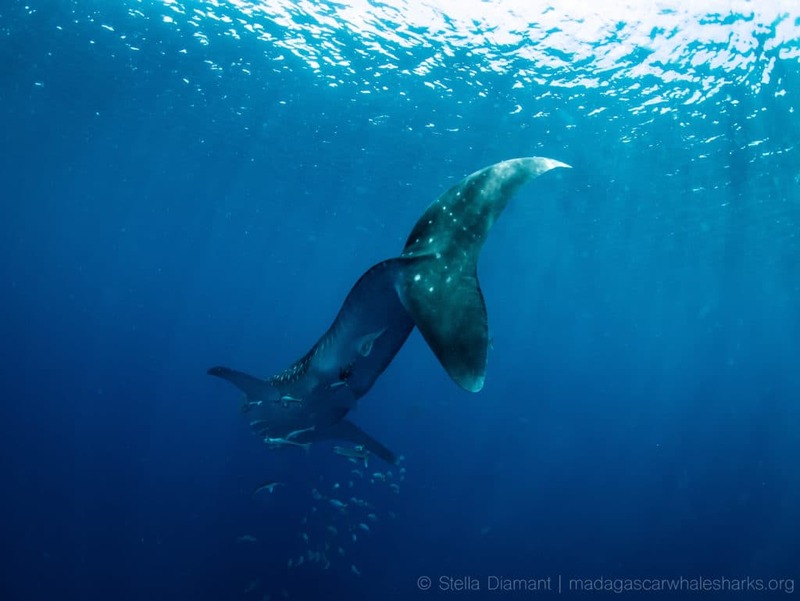 The study is part of the Madagascar Whale Shark Project, a collaboration initiated in 2016 by researchers from the Marine Megafauna Foundation, Florida International University, and Mada Megafauna. Whale sharks are the largest fish in the world, growing up to 20 meters long. However, all of the sharks seen in Madagascar have been juveniles of less than nine meters. “We identified 85 individual whale sharks over our first season in 2016. Some of the sharks were present across several months. 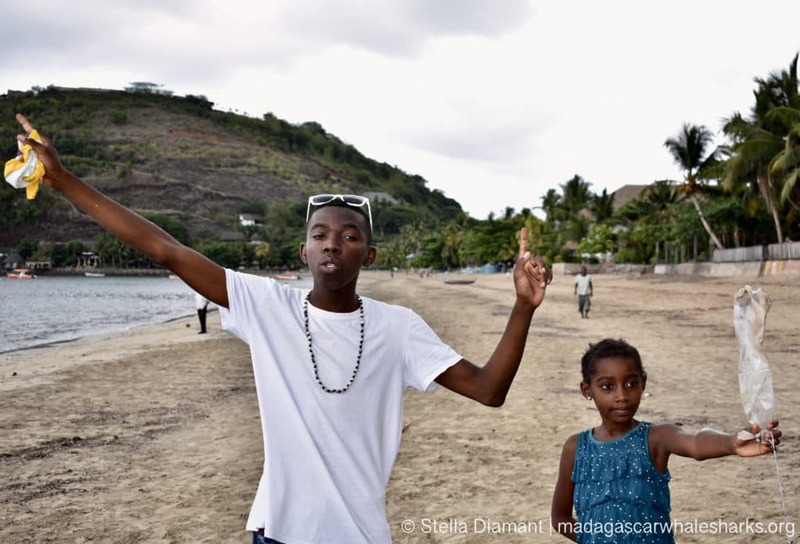 They spend a lot of time in the area and seem to come here to feed,” Diamant said. The marine biologists uploaded photographs of the sharks’ unique spot patterns to Wildbook for Whale Sharks (a global database of sightings) and compared them with data collected from known feeding areas in the Indian Ocean, including Djibouti, the Maldives, Mozambique, Seychelles and Tanzania, but found no overlap. “Whale sharks are a globally endangered species due to overfishing, accidental catches and boat strikes. Major declines in sightings have been seen in Mozambique, where we’ve documented a 79% decline in sightings since 2005, and the Seychelles. I was hoping that some of those sharks might have shifted over to Madagascar”, said co-author Dr Simon Pierce, co-founder and principal scientist at the Marine Megafauna Foundation. “Unfortunately, that doesn’t seem to be the case. It’s great news for Madagascar though. These sharks can be a major asset for the country. There’s already a good marine ecotourism industry developing”, he added. As part of this study, the team attached eight satellite tags to immature whale sharks to track their movements in near real-time. They found that the sharks spent most of their time in shallow waters between 27.5-30°C around the tagging area in Nosy Be. Half of the tagged sharks also visited a second hotspot near Pointe d’Analalava, 180 km south of Nosy Be. Five of the sharks swam over to Mayotte and the Comoros islands, and two swam right down to the southern end of Madagascar. One of those sharks then swam back to Nosy Be, a total track of 4,275 km. The sharks are slow-swimmers, travelling an average 21 km per day. Three sharks were resighted in the Nosy Be area the following season after having lost their tags. “It was exciting to see that there is a second hotspot for the sharks in the area. We will be exploring the area later this year. 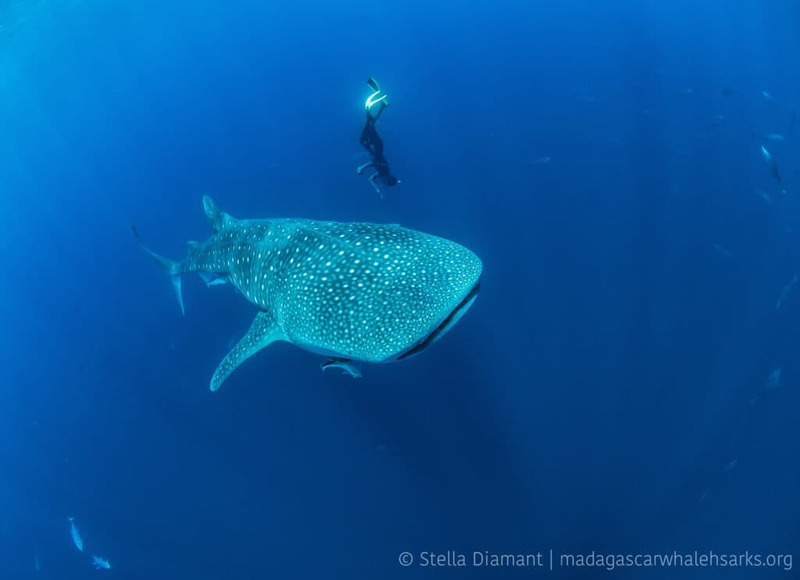 Madagascar clearly provides an important seasonal habitat for these young whale sharks, so we need to ensure they are effectively protected in the country”, concluded Diamant. Madagascar is a known location for shark fishing and finning. Whale sharks are currently afforded no formal protection except in two Marine Protected Areas located to the southwest and northeast of Nosy Be. “Over the last decade, shark populations have declined dramatically in Madagascar due to overfishing. However, the most significant threat to this species is the incidental catch in coastal gillnets and industrial purse seiners operating offshore”, said Dr Jeremy J Kiszka, a marine biologist at Florida International University and co-scientific lead of the Madagascar Whale Shark Project. Whale sharks are listed as ‘endangered’ on the IUCN Red List of Threatened Species since 2016 and received an Appendix I listing the UN Convention on Migratory Species in 2017. As a signatory to the Convention, Madagascar is obligated to protect the sharks and their migratory habitat in national waters. The study was supported by Les Baleines Rand’eau, Aqua-Firma, PADI Foundation, IDEA WILD, Waterlust, the Shark Foundation, and two private trusts. Stella Diamant, Christoph A Rohner, Jeremy J Kiszka, et al. ‘Movements and habitat use of satellite-tagged whale sharks off western Madagascar’ is published on 17 May 2018 and is be available here. The Marine Megafauna Foundation was created in 2009 to research, protect and conserve the populations of threatened marine megafauna around the world. ‘Megafauna’ are large marine species such as sharks, rays, marine mammals and sea turtles. For further details, please see marinemegafauna.org or follow us on Twitter and Instagram. For information about regional projects, follow the Marine Megafauna Foundation’s Western Indian Ocean Facebook page.